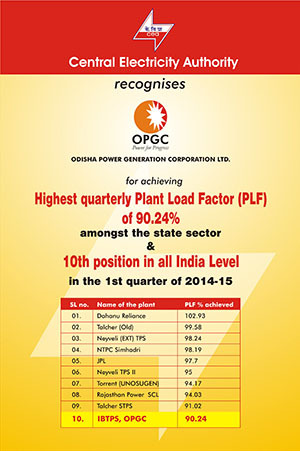 IB Thermal Power Station (ITPS) of Odisha Power Generation Corporation (OPGC) has added one more feather to its cap by achieving highest quarterly PLF (Plant Load Factor) of 90.24% amongst all the State Sector thermal power units in the 1st quarter of 2014-15. As per the report published by Central Electricity Authority, Ib Thermal Power Station of OPGC has achieved highest 90.24% PLF in the 1st quarter of current financial year 2014-15. According to the CEA report, OPGC has also ranked 10th amongst all thermal power producers (Govt. & Private) across India during this period. During this 1st quarter (peak summer), OPGC’s consistent efforts to maintain efficient power production at its Ib Thermal Power Station, as evident from the report of CEA, has certainly aided Odisha during this peak power requirement season.